Mosaic Canyon is beautiful but urgh I am sweating profusely, my sunglasses are slipping from my face, my shirt is sticking to my back and the salty sting of sweat in my eyes is becoming unbearable. Yes I am in the hottest place on earth and yes I am hiking. 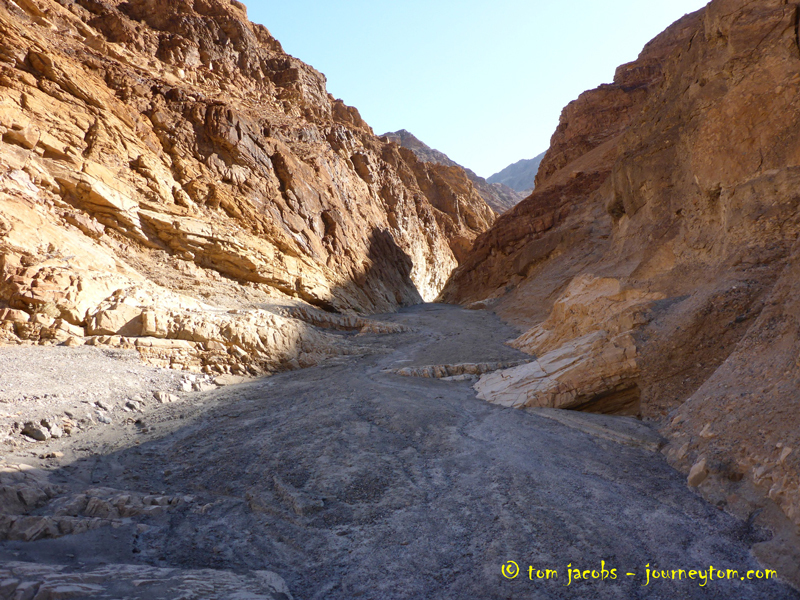 Hiking and extreme heat are probably not what would be described as a match made in heaven but the hike through Mosaic Canyon in Death Valley had been recommended to me by a friend and also by the helpful woman at the Furnace Creek visitor centre. So I decided I should definitely do it. Whilst the colours of the canyon are supposed to be at their best from midday I just couldn’t bring myself to begin this hike in the extreme heat. I opted for fairly early morning. I say fairly early morning as I’m not really a morning person 8am is fairly early for me! My hotel at Stovepipe Wells was right near Mosaic Canyon so after a hearty breakfast I drove up the dusty gravel track to the canyon opening. I was actually quite surprised at home much higher the entrance to the canyon was from the main road. It was kind of hard to judge the scale, distance and depth of the terrain in Death Valley due to the vastness. Getting to Mosaic Canyon early was a definite plus. We were the only people there and the silence within the canyon felt incredible. Mosaic Canyon starts off quite small and narrow before beginning to open out the further in you go. Whilst beautiful and well worth the trip there is a downside to this hike – it is a one way in and one way out route. Unfortunately there is no circular path so technically you have to walk it twice. The hike ends at a dried up waterfall and at that point you have to turnaround and come back. Because of this we decided not to walk the full length of the canyon and explore it a bit more. We scrambled up its walls looking for vistas and view points to really take in the beauty of the area. 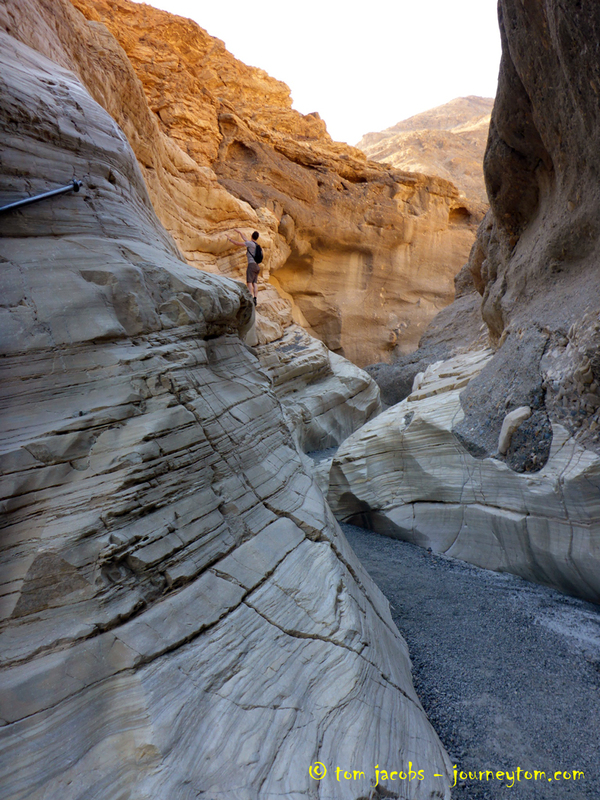 As Mosaic Canyon opened out it became hard to judge sizes and distances again. I foolishly thought it wasn’t far to scramble up a particular rock face before collapsing in a heap at the top, my t-shirt soaked through with sweat. Bring water and lots of it! If you are hiking in this sort of heat you should be drinking regularly and consuming 4-6 litres a day. I know its heavy to carry lots of water but out here you need it especially if you are exerting yourself and scrambling up steep canyon walls! 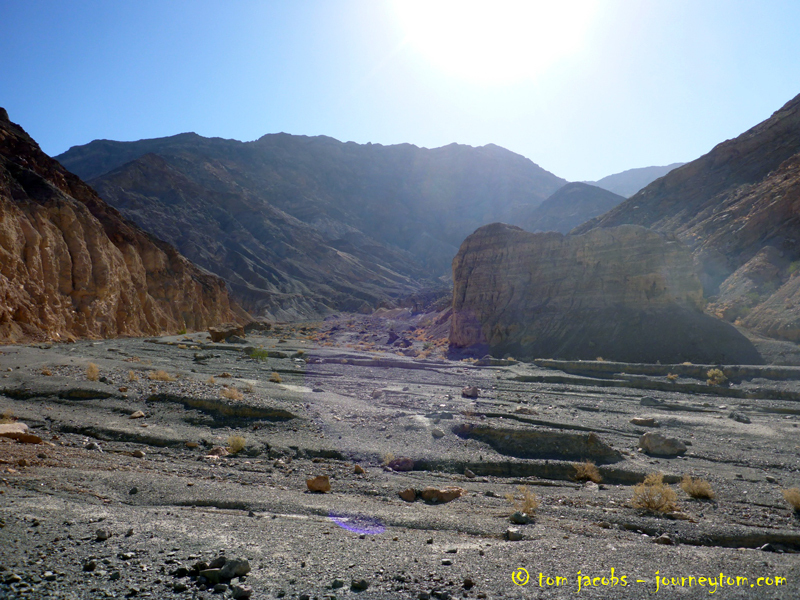 Mosaic Canyon made me realise how much there is to see and do in Death Valley in my previous post ‘into the frying pan’ I mentioned how I wish I had given the area more time. 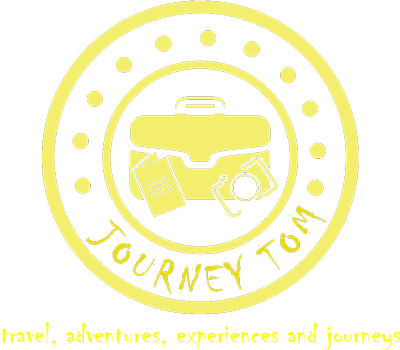 This hike whet my appetite for discovering more in the region. I spent about 2-3 hours exploring Mosaic Canyon before having a shower to cool off and leaving Death Valley altogether. It was a perfect way to end a short one night stop in such an incredible place and the drive out of the National Park and onto Yosemite was epic with sandstorms and desert scenery giving way to the majestic Sierra Nevada mountain range in the distance revealing the true diversity of California. Have you ever been to Death Valley? Do you wish you had stayed a bit longer to? Yes! Just went there this weekend! The landscape is breathtaking and it’s such a wonderful, calming experience. But yes, my legs hurt from all the hiking. Next time I do want to spend 3-4 days. I’ve never been to Death Valley, but the heat actually sounds nice right now. The snow is flying sideways and the temp is near zero here in Colorado. Too bad the hike ends at a dried up waterfall and not a flowing one. sounds like a tough hike in the heat but what spectacular views you were rewarded with! The Death valley has been on my bucket list for a long time! I can’t wait to visit all those parks in the States. The only problem is that I might visit Iran first, and I heard I might have problems getting the USA visa with an Iranian stamp in my passport. We’ll see how it goes!